The Han Solo movie is bound to have some nice glamor shots of the Millenium Falcon, and it's even going to give us a look at the iconic ship which has never been seen before (and I don't mean an official new paint job). Lando Calrissian actor Donald Glover reveals in an interview with Slash Film that he’s excited about one Falcon shot in particular, also describing a scene from Solo: A Star Wars Story in the process. "I remember going on set one of the first times, [Howard] was like, 'Yeah, I want to follow you onto the Millennium Falcon and do this thing,'" Glover said. "I was like, 'I don't think I've ever seen the outside go into the inside.' He's like, 'Yeah, no one's ever done that shot.' As a fan I was like yeah, I was really excited. I know there's been a lot of talk in the press about this movie but for me anyway, it was a dream and also it looks really cool to me." An interior shot of the Falcon, including former directors Phil Lord and Christopher Miller. 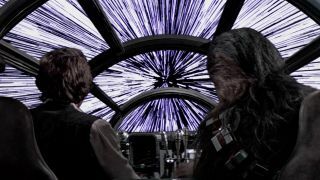 Much as Star Wars does to establish the Millenium Falcon both as a vehicle and its own location, it hasn't done much to bridge the gap between the two before. It's easy to understand why; the Falcon's exterior and interior(s) were wholly separate things for filming purposes. The Han Solo movie will finally unify them in a way that probably would have seemed totally natural and unremarkable if Glover hadn't specifically called out the historical significance. Speaking of call-outs, I've been a bit worried about the quantity of reshoots and tonal changes that Howard may have pushed for after taking over director duties from Phil Lord and Christopher Miller. Good news: the transition wasn't very disruptive for Glover. "Not a ton [of reshoots] actually," Glover said. "Not a lot at all, at least not for me. I think we've all never been faced with anything like that and I think he did a good job of coming and tell us he didn't want to change what we were doing at all. He wanted us to remain confident in our vision. He just wanted to sculpt it in a way."